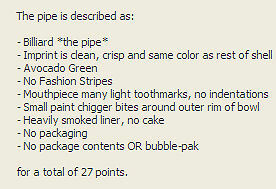 The value of pipe #306 is 27 points. Harry of P&H Antiques offered this only somewhat dinged pipe on eBay. I was lucky enough to win the bidding and added the first Avocado Green Billiard to the collection. Over a year later, a brand new pipe in this shape/color came to me in its original box with the Story of the Pipe included so this one moves to the Pipes for Trade page. I will enjoy smoking it until someone wants it. Bill Jouris bought some pipes and, after careful consideration, bought some more a few days later; this one among them.